Djimbarrdjimbarrwuy gives brilliant form to the conditions found at particular places in country at certain times of the day. In 'Oysters growing on rocks at Guruwana' c1960 he depicts an important location on the mainland near Elcho Island, where oysters are found. The central form in the work alludes to a rock formation under the water, to which dead, broken, empty and full oyster shells are attached, their various states indicated by the differing colours and infill techniques. This tidal country is surrounded by mud, as indicated by the yellow bands that run horizontally across the work. In the related work 'Guruwana – a sacred place' c1959, Djimbarrdjimbarrwuy provides the additional element of a band of cross-hatching within the segment of mud to indicate the presence of rocks that are covered and uncovered by saltwater as the tides rise and fall. 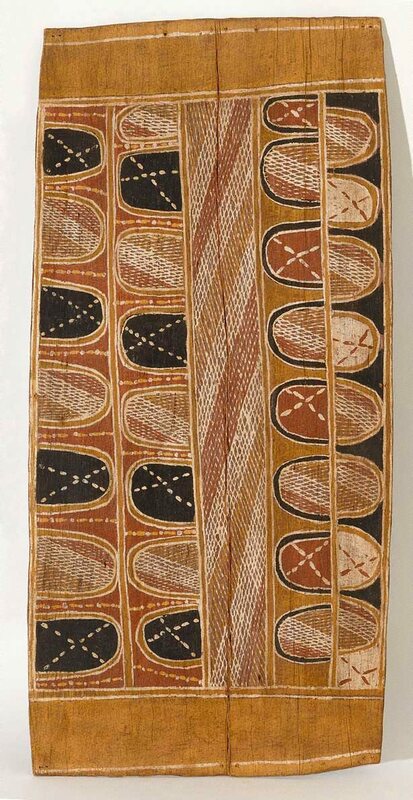 Djon Mundine, One sun one moon: Aboriginal art in Australia , ‘The concept of style in Central Arnhem Land’, pg. 99-104, Sydney, 2007, 98 (colour illus.). Cara Pinchbeck, Art from Milingimbi , ‘Djimbarrdjimbarrwuy’, pg. 86-91, Sydney, 2016, 91 (colour illus. ), 135, (colour illus., detail), 141.